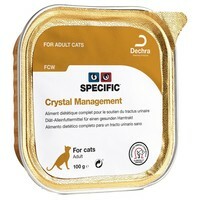 Specific Crystal Management FCW Wet Food Trays for Adult Cats is a nutritionally complete diet to help prevent recurrence of struvite and calcium oxalate stones in adult cats. Designed to help dissolve existing stones by making your cat’s urine more acidic, Specific Crystal Management also has a reduced level of magnesium and phosphorus to help prevent new crystals from forming. Specific Crystal Management also has a high sodium content that will promote your cat to drink more; effectively diluting their urine and increasing their urinary frequency.